The Centre on Thursday reiterated its commitment to ensure fast track development of the North Eastern region. 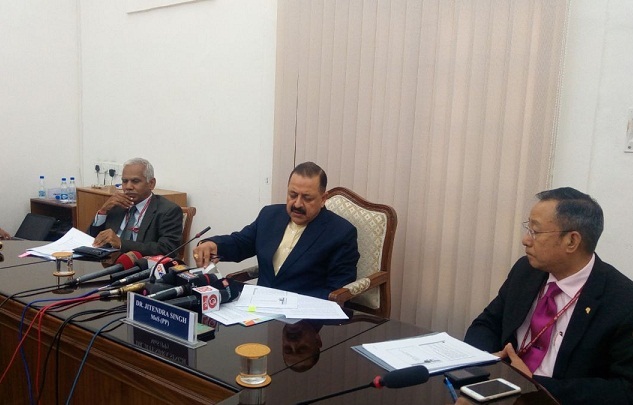 “Our government has taken major strides in the development of the Northeastern region in last four years,” DoNER minister Dr Jitendra Singh said after chairing the Consultative Committee meeting. While addressing the members of the committee, Dr Singh said that there was a need to highlight special qualities of each state for developing its unique identity alongside the collective identity of ‘North East’. He said this will provide developmental, economic, cultural and political identity and impetus to each of the NE states. Dr Singh further said that there was a need to synergize the efforts of the Ministry with that of the concerned state agencies for overall development of the region. To various issues raised by the members of the Consultative Committee regarding the need for expanding markets, Dr Singh remarked that the Ministry of DoNER was also exploring areas of collaboration with other Ministries so as to tap domestic and international market. He also stated that the Ministry would focus on aligning with state agencies of other states to provide mechanism of selling to each other’s handloom and handicrafts products. Mentioning the various steps taken by the Ministry for expanding markets for local artisans, Dr Singh said that handloom counters and showrooms for exclusively NE products were being opened at various airports across the country. Handloom counters were also being opened in various cities of India outside NE region including Metro cities, he added. He said digital shopping interfaces were being developed to capture online customers. The minister also said 20 percent rebate on freight charges and 30 percent on air cargo is being given for the products produced in NE region. Dr Singh also informed the members of the Committee that the DoNER Ministry was taking several steps to facilitate loan availability by emulating models of Bihar and Andhra Pradesh. He said MoUs have been signed with IDBI and other banks and there had been substantial progress in states like Tripura, Sikkim, Nagaland and Mizoram. Speaking about the state of health institutions in NE region, Dr Singh said that government was committed to reach the remotest corners of the region for providing health facilities and was working for making doctors available through air-ambulances. He also extended his support for investment by private sector through Public-Private Partnership (PPP) model in health sector.